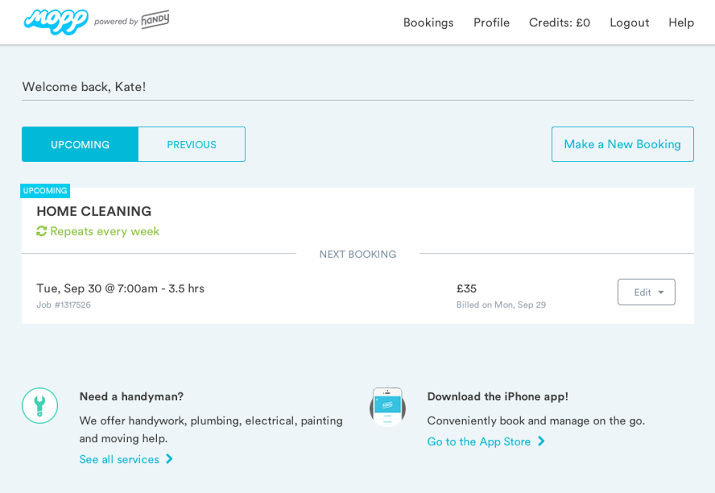 Following a recent rebrand from Handybook to Handy, the US-based platform for getting help with your household chores has announced that it has acquired UK-based Mopp. The “multi-million pound deal” will see Mopp’s platform rebranded as ‘powered by Handy’ in the UK and will further Handy’s ambitions to control more of the home services market internationally. Right now, it’s a hotly contested space for the company, both at home and abroad, with the likes of Helpling, Homejoy, Hassle and more all operating in a similar space. Mopp founders Pete Dowds and Tom Brooks will stay with the company to help run the UK and European operations. A spokesman told TNW that, in the longer term, the plan is to transition both platforms across the Handy branding globally. For Mopp users, there are a few benefits from today. For example, users now have their own customer login, which allows them to change, re-schedule or pause bookings, and thanks to the extended services of Handy’s network, they can also now choose ‘Extras’ like laundry or fridge cleaning.